He attended the University of Guam as a full-scholarship recipient from the Yamashita Educator Corps and received his Bachelor’s of Education with an emphasis on Fine Arts- Music Performance (clarinet) in 2002. Mr. Ronquillo has been a member of the Guam Territorial Band since 1991, where he first joined playing the clarinet. In 2001, upon the retirement of Dave Poblete as the Guam Territorial Band Music Director, he served as music director in an acting capacity until his full appointment in 2003. Some of his most recent achievements include his leading of the Guam Territorial Band to a Silver Award at the 2007 New York Band and Orchestra Festival at Carnegie Hall, and the Gold Award at the 2005 Australian International Music Festival in Sydney. In August 2008, along with Marching Director Jacob Mafas, lead the Band at the 2008 Beijing Olympics. In 2003, he became the Director of Bands at George Washington High School where he conducted the school bands and taught music appreciation. In 2015, he became the Director of Bands at Okkodo High School where he has thriving Concert and Rock Bands. In March 2005, he led the work in establishing the Tumon Bay Music Festival, the largest music festival in the Marianas encompassing vocal and instrumental, solo, small ensemble and large ensemble performances encompassing a vast genre of music to include jazz, rock, gospel, and the masterworks. An educator through and through, he developed and established the Guam Band Academy, GTB's "school of music." The Academy, now hosting its third class, seeks to provide interested musicians with the tools necessary for success in their musical endeavors. It also aims to develop more leaders in our community while perpetuating the ideals of the organization. A recent graduate of the Army Band Master Officer Basic Course at the Army School of Music in Virginia Beach, VA, he is the Commander/Band Master for the 721st Army Band, Guam Army National Guard. He is a member of the World Association of Symphonic Bands and Ensembles (WASBE) and is an Honorary Life Member of the Tri M Music Honor Society - Simon Sanchez High School Chapter. Joanne Matanane Sosa is a professional musician and music educator on Guam. She has played with the Guam Territorial Band, the Guam Symphony Orchestra, and the University of Guam Band as a flutist and percussionist. She has sung with the University Singers, University Chorale, and the Guam Symphony Chorale, and is an occasional soloist with GTB. Dedicated to music education, Ms. Matanane Sosa assists Chief Band Master Maximo Ronquillo, Jr. at the Guam Band Academy. She is the program director for the Guam Honor Band and Summer Marching Band, and is the band director at L.P. Untalan Middle School. She also gives private lessons in her spare time. Ms. Matanane Sosa was a Merit Scholar and is listed twice in Who's Who of America. She is an Honorary Lifetime Member of the Tri-M Music Honor Society. Hailing from the village of Mangilao, she is part of the 8:00 AM parish choir at Sta. Teresita Church. She attributes much of her music development to her participation in the choir, of which she has been a member since 1998. Brandon is a meteorologist with the National Weather Service and has lived on Guam since February 2010. 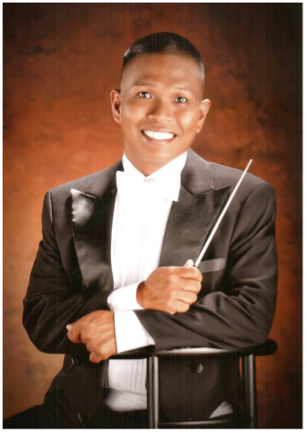 Since moving to Guam he has joined the Guam Territorial Band and performed with the Guam Symphony for two seasons. He is also a member of the Guam Territorial Band Brass Ensemble that includes several of the brass members of the GTB. Brandon has been involved in music since 1994 when he first started on the trumpet in middle school. In high school he was a member of the concert, marching and jazz bands, and was also student director his senior year. Outside of school, he was a member of his church orchestra for several years. After previously planning to major in music, he enrolled at North Carolina State University to study meteorology. While there, he enjoyed traveling with the marching band for four years, often attending bowl games when the football team wasn’t bad…and played in the pep band for a couple of years. In 2007 Brandon moved to Kwajalein, Marshall Islands, for his first meteorology position. While on the small island, he met weekly with a few dozen other islanders in the Kwajalein Community Band and played every Sunday in the small church band. Brandon has enjoyed each of the musical groups on Guam he’s been in and looks forward to new musical challenges the future holds.